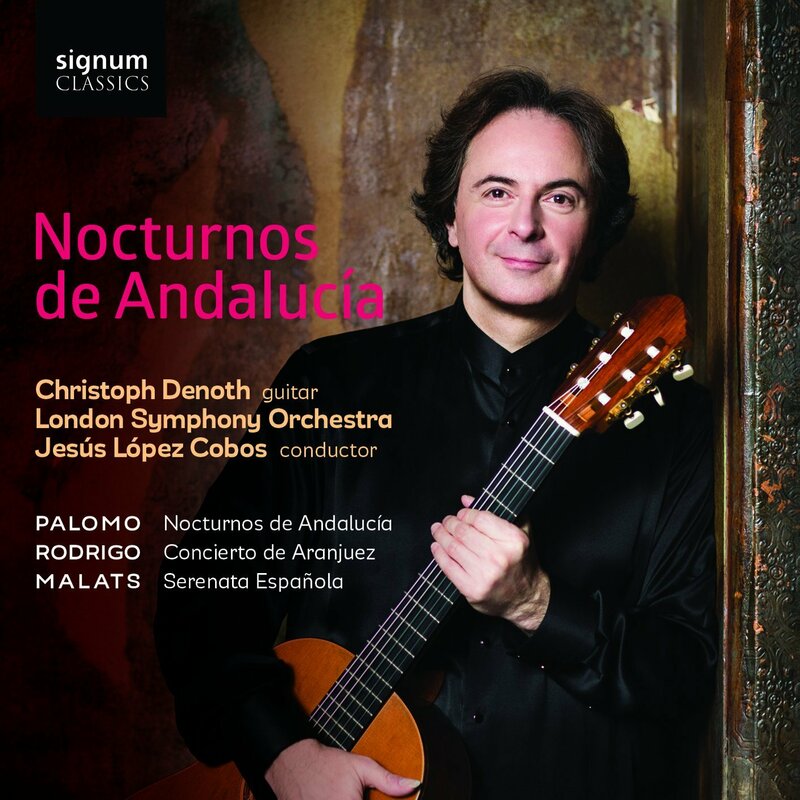 When I interviewed guitarist Christoph Denoth in 2015, he was preparing for performances of Lorenzo Palomo's Nocturnos de Andalucia and looking forward to making this recording. It is a work of which he spoke most highly, so I was pleased to be able to explore the work on disc. 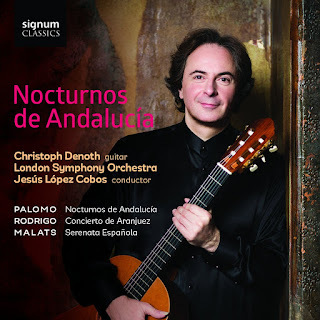 Denoth has recorded Lorenzo Palomo's Nocturnos de Andalucia along with Joaquin Rodrigo's Concierto de Aranjuez and Denoth's own arrangement of Joaquin Malats' Serenata Espanola with conductor Jesus Lopez Cobos and the London Symphony Orchestra on the Signum Classics label. The guitar still remains something of a special case when it comes to concertos, the instrument's rather modest volume can be an inhibiting factor. In a good concert hall, there is no problem in solo recital but the sound quality is such that it can be relatively easily overwhelmed by an orchestra. Joaquin Rodrigo solved the problem by using relatively modest forces, but Lorenzo Palomo uses a full symphony orchestra in Nocturnos de Andalucia and manages to make the guitar stand out. Lorenzo Palomo was born in the Southern Spanish province of Cordoba and his music is very much infused with the music of the area. 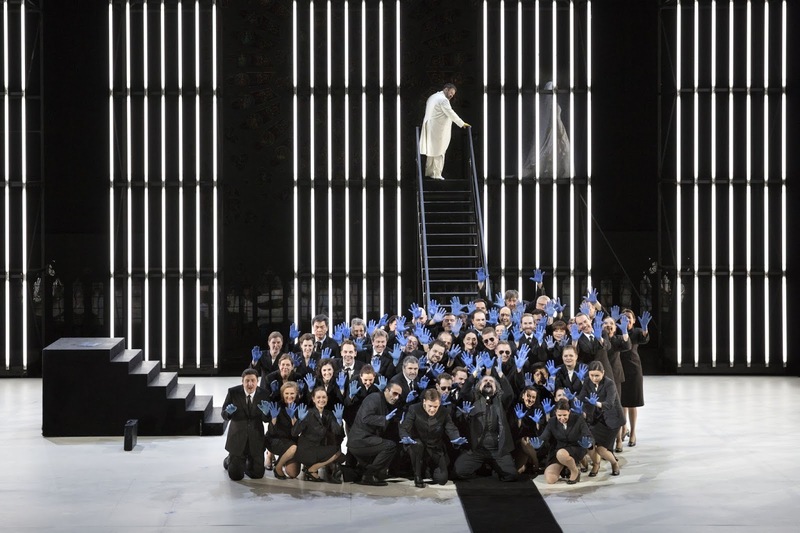 Born in 1938, Palomo was in fact conductor and pianist at the Deutsche Oper, Berlin from 1981 to 2004 and Nocturnos de Andalucia (Andalusian Nocturnes) was written in 1996 for guitarist Pepe Romero who premiered it in Berlin with the Berlin Radio Symphony Orchestra conducted by Rafael Frubeck de Burgos. A forty minute suite with six movements of unequal lengths with the longest being over 13 minutes and the shortest just over two. Each movement has a descriptive title and though the titles might lead us to expect the sort of exotic Spanish-isms which have been common currency in 19th and 20th century music, this is anything but hackneyed. The CD booklet essay by Daniel Jaffe refers to the music of Bela Bartok, and though Palomo's style is by no means Bartokian, his music brings Spanish traditional music into the 20th century combining dissonance with complex harmonies. And the Andalusian music which Palomo references is not the picture-postcard tourist pleaser but the darker more intense Flamenco which he experienced as a youth when attending improvised tablao Flamenco in Cordoba. Brindis a la noche (A Toast to the Night) begins with a bang, a vivid, exciting cityscape with underlying Spanish hints. The orchestra goes full pelt and you wonder how on earth the guitar will cope. When the guitar comes in we understand how Palomo's writing works, the orchestra evaporates to nothing and the solo guitar duets with one or two instruments. 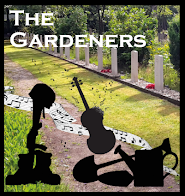 At first the guitar is moodily contemplative, but the more exciting passages connect to the opening introduction and a dialogue with orchestra ensues. Anyone who has been in a Spanish city at night will recognise the sound world being evoked. Sonrisa truncada de una estrella (Shattered Smile of a Star) is rather collage-like, combining lyrical outpourings from the guitar with violence in the orchestra. Danza da Marialuna starts much closer to popular song, as Palomo imagines a young girl getting ready to dance, but then the music gets darker and more intense. There is a fluid sense to this long movement (13 minutes), and Palomo combines his Andalusian roots with an eclectic orchestra palate, even referencing Rodrigo-like textures. Rafaga, (Gust of Wind) is a slight movement, lively and busy with some lovely textures for guitar and a few instruments. 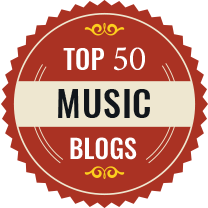 The music has an edge to it here, not always comfortable and then evaporates. Nocturno de Cordoba evokes the Cordoban night in music which is spare, haunting and lovely, with a rather filmic feel to the descriptive passages. Finally El Tablao evokes the Flamenco stage. Here rhythmic tapping is an important feature of the movement, a semi-constant presence just as it is in Flamenco. The music is colourful and melodious but the textures are still complex and intriguing. The drama and excitement do not preclude solos for the guitar, and all ends in a real explosion. The companion work on the disc is the far better known Concierto de Aranjuez by Joaquim Rodrigo. In his booklet note Daniel Jaffe explains that the works somewhat backwards looking style arises partly from the times in which it was written. Composed in 1939, the work appeared shortly after the Civil War had ended and the new regime was interested in music which celebrated order. 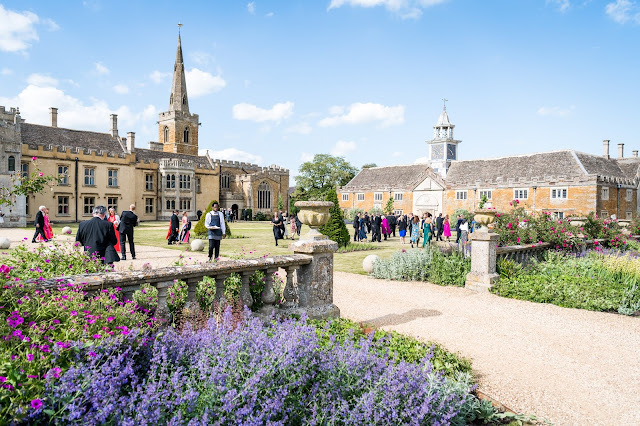 Rodrigo's concerto looks back to the 18th century, with its celebration of the gardens in Aranjuez, skilfully combining 18th century-ism with Spanish rhythm and music. The opening movement is wonderfully exciting and very engaging, with Denoth bringing real brio to the guitar part. The slow second movement is as beautiful as ever, with some lovely solos from the orchestra, whilst the last movement has a sense of perky delight to the neo-18th century tune, with both soloist and orchestra bringing an engaging crispness to the melody. Joaquin Malats' Serenata is familiar as a solo guitar piece, but here Christoph Denoth has expanded it to form a delightful orchestrally accompanied serenade. A lovely encore piece. Inevitably Denoth's guitar is recorded quite closely and the balance seems somewhat artificial and not quite what you would experience in the concert hall. I have yet to hear Palomo's suite in performance, but have been assured that Paolomo's inventive orchestration works brilliantly in concert hall too. Throughout Denoth impresses both with his technique, but also with the engaging way he plays the music. He clearly feels strongly about Palomo's work, and brings out the interesting darkness and complexity of Palomo's vision of Anadalusia. Whilst the Rodrigo is a lovely, highly recommendable performance, it is the Palomo which makes this disc special. I do hope that the performance makes more guitarists take up this fascinating work.